An intimate screening with champagne, popcorn, and a gorgeous dinner to follow takes going to the pictures to a new level at One Aldwych. Film and Fizz is my idea of the perfect night at the movies. Read on to find out more. I have to admit that I rarely venture to the pictures to see a film these days; I think that the experience has been somewhat marred for me from taking my son when he was young, I stopped enjoying it when I had to endure Pokemon films! The invitation from One Aldwych seemed tempting though; a proper grown-up evening with a glass of Lallier Grande Réserve Champagne to sip during the film, with optional popcorn, followed by a 3-course meal in the dairy-free and gluten-free Indigo restaurant. The cinema is compact, seating 30, with comfortable leather chairs containing clever little pull out shelves to rest the popcorn and champagne on. We thoroughly enjoyed the choice of film on the night we attended; Ladybird, an American coming-of-age story that avoids being schmaltzy. Other films in the series include; Grease, I, Tonya, Ready Player One, Red Sparrow, Finding your Feet, Isle of Dogs, Ghost Stories, On Chesil Beach (which I’m looking forward to seeing, having loved the book), and many more. Once the film finished, we made our way upstairs to Indigo (our coats magically having been transported there ahead of us; these little touches are what makes One Aldwych such a lovely venue, whether for the Charlie and the Chocolate Factory afternoon tea or for Film and Fizz). 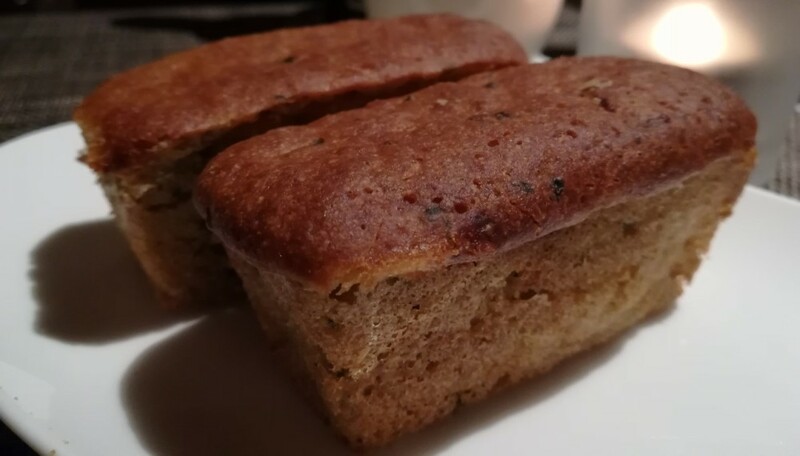 Whilst we pondered our choices we nibbled on our own individual loaves, which were hot, fluffy and gluten-free, served with rapeseed oil for dipping purposes. The set menu has a choice of vegetarian, fish, or meat dishes for the starters and main courses, followed by a choice of three desserts. Alex decided to have the home smoked sea trout, served with confit lemon, wood sorrel and watercress. This was as pretty as it was delicious. 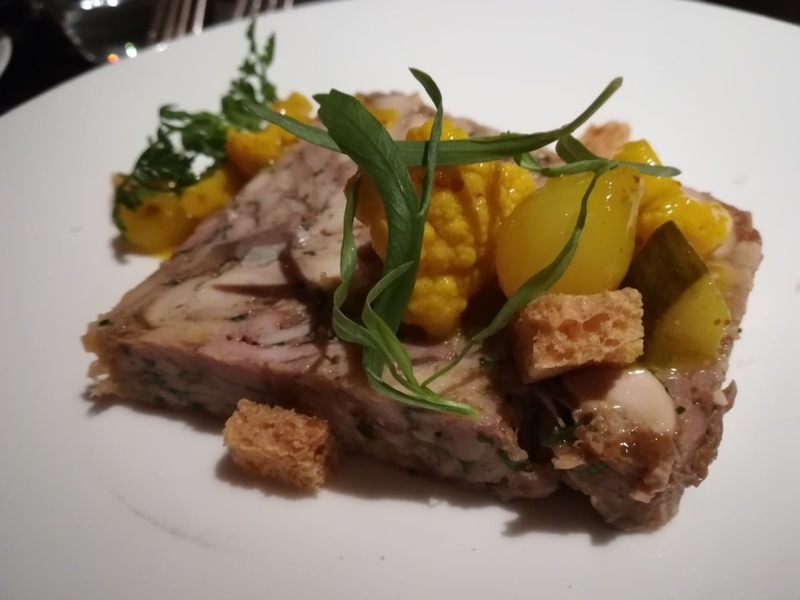 I had the pressed cornfed chicken terrine, served with a home-made piccalilli which had the perfect amount of crunch and acidity to balance the richness and soft texture of the terrine. Alex then went on to enjoy dry aged beef with wild garlic, morrels and new season Jersey Royals. This was declared to be rich and delicious. The shine on the sauce is the one aspired to on Masterchef. 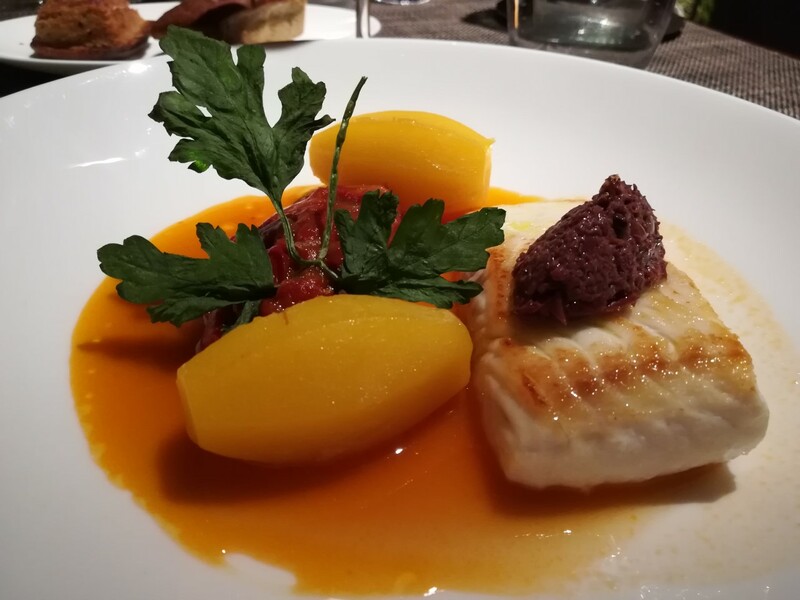 I enjoyed a beautifully fresh piece of halibut served with roasted peppers, capers, olives and Canadian Minus 8 Vinegar. I rather suspect that my potatoes had been cooked with saffron. 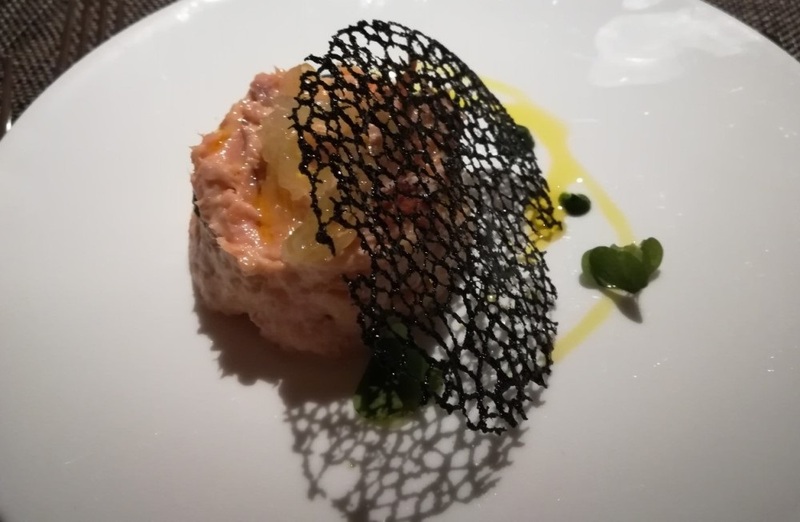 This was another pretty dish. With forced rhubarb from Yorkshire now in season, Alex opted for a dish described as rhubarb and custard. 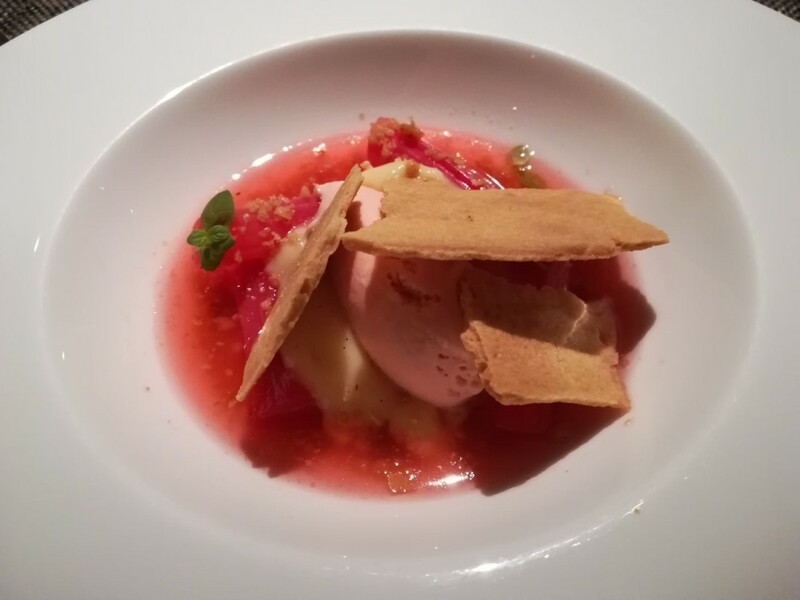 This was a far-cry from the sort of dessert that my mother would have prepared; it was light and delicate with a hint of vanilla in the rhubarb ice-cream. It’s also the time of year for blood oranges, which are a favourite of mine in savoury dishes as well as on their own, or served as part of a dessert. 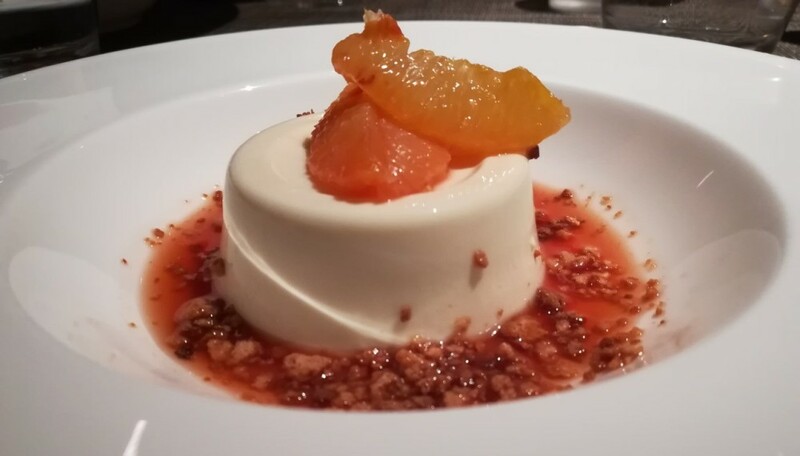 In this case, they came with a perfectly wobbling pannacotta. We received perfect service throughout the evening. 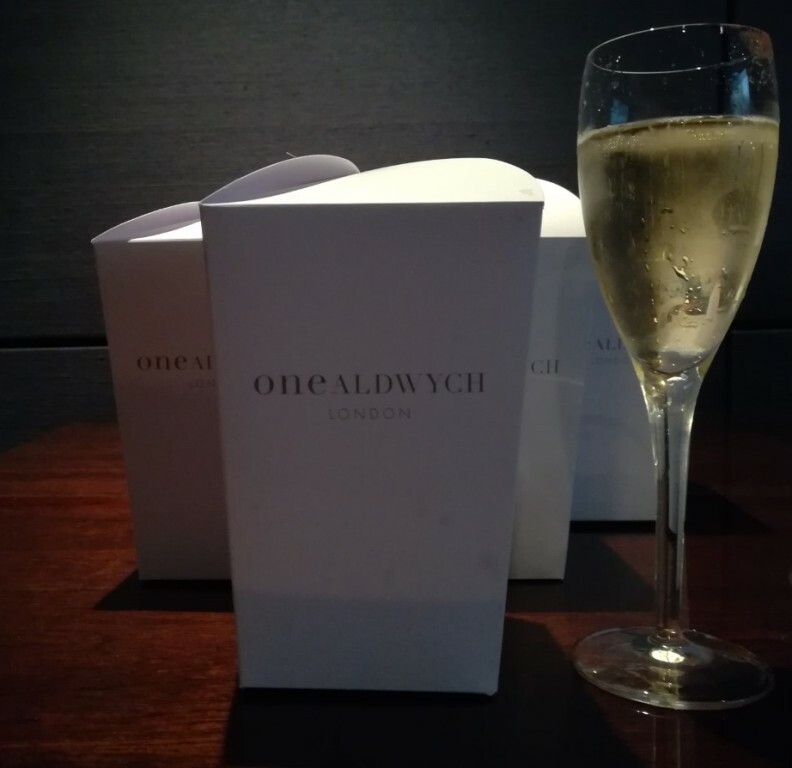 I can heartily recommend the film and fizz evenings at One Aldwych – why go and sit in a mediocre venue when you could be sipping champagne and anticipating a fabulous meal? 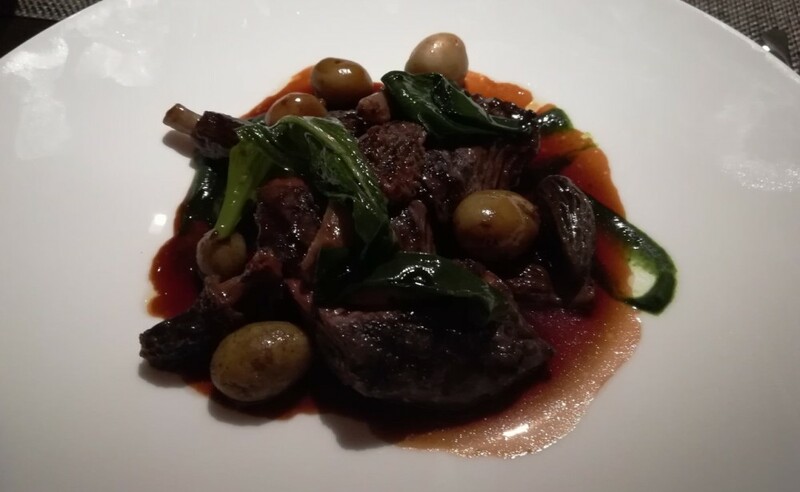 Disclosure – We were guests of One Aldwych but all content is editorially given. It really is the nicest evening I’ve ever spent at the pictures!